A museum in the making and an open-air collection of tanks, armoured vehicles and military planes on display at an old military site in the south of the city of Karlovac in Croatia. In the Croatian War of Independence (aka “Homeland War” in Croatia) from 1991 to 1995, Karlovac found itself right on the front line between newly independent Croatia and the breakaway Serbian Republic of Krajina. Turanj was taken by the latter and suffered much damage. Today the ruins of the former Austrian military barracks form the backdrop to a collection of armoured vehicles and other objects from the Homeland War. One of these ruins was being turned into a proper museum, with an indoor exhibition, when I visited the place in late March 2018, but I don't know when it was scheduled to open its doors to the public. It could well be that by the time you read this, it's fully operational. 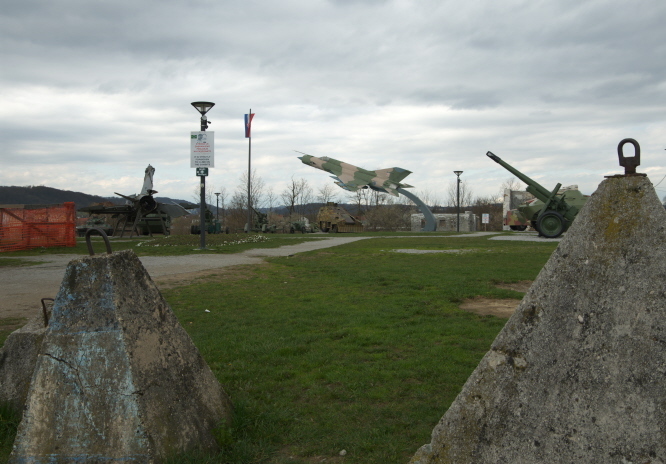 The Turanj ex-military complex and the collection of Homeland War weapons is run as part of the Karlovac City Museum. What there is to see: Not an awful lot (yet), though those who like looking at tanks, artillery, fighter jets and such like will be in their element. The star piece has to be the Croatian MiG-21 jet on a curved stick that makes it look like the plane is in mid flight. In addition, there is also the tail part of a Yugoslav Air Force MiG-21 that was based at the Željava underground airbase and was shot down during the Homeland War in November 1991. The rest of the objects are ground-based, including about half a dozen tanks, an amphibious transport ferry, some artillery pieces and armoured personnel carrier vehicles (some of which look a bit improvised – cf. also the Homeland War Memorial Centre in Vukovar). The open-air display area is flanked by three ruins of brick buildings, presumably former military barracks dating back to the Austrian military's presence in the area until WW1. The two ruins to the north of the museum are out of bounds – signs warn that these structures are unsafe (though they don't look especially fragile and in danger of collapse). One of these has a row of one-man-bunkers in front of it. 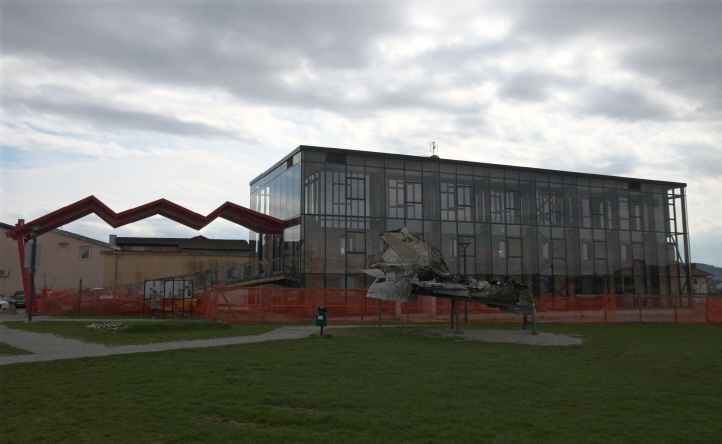 A third ruin on the southern side of the open-air display area was in the process of being converted into a museum proper at the time I was there. The brick walls were encased in a glass outer superstructure, and a ramp leads up to the first floor level to what will become the entrance to the museum exhibition. But it was still blocked when I was there in late March 2018. Maybe by now it's open (please contact me if you can confirm this). For the time being there were a few information panels also in the open-air display part next to the museum-to-be. These provide some photos and maps and texts with a timeline of the war. The texts are all in Croatian only, though. In addition there is one panel in English that gives an overview of the open-air-display area and the objects to be found there. Just outside the museum, in the middle of a traffic island, is another war memorial listing names of the fallen combatants. All in all, it's worth a brief stopover en route through Karlovac, but I wouldn't necessarily say it's worth the drive from Zagreb, unless you're really into military hardware displays. Location: in Turanj on the southern edge of Karlovac, central Croatia, on the banks of the Korana River, ca, 35 miles (60 km) south-west from Zagreb. Details: To get to the museum you have to have your own means of transport. It's a ca. 10-minute drive from the centre of Karlovac along the main No. 1 trunk road south (in the direction of Plitvice), on the right, just after the second bridge across the Korana River. You can't miss it, the MiG on a stick alone serves as a perfect landmark. There's a small car park directly by the museum. From Zagreb the drive takes about 45 minutes to an hour. The open-air part is freely accessible at all times. As regards opening times and admission fees for the museum exhibition, I haven't been able to find anything out yet. Time required: depends on how much you get out of looking at military hardware. I didn't need long, just 10 minutes or so, but then again that was before the indoor exhibition was open, which would surely have eaten up at least half an hour extra. Combinations with other dark destinations: Karlovac makes a good starting point for the trip up to Petrova Gora to the south-east of the city. But it also combines easily with Zagreb to the north-east. Combinations with non-dark destinations: Kalovac is on the main route between the capital Zagreb and the county's No. 1 natural tourist attraction, the Plitvice Lakes, so combines perfectly with these – see under Croatia.